Mar 01, 2017 in "Epcot International Flower and Garden Festival"
The 2017 Epcot Flower and Garden Festival is now underway, marking the 24th year of the event, and running for 90 days through to May 29 2017. This year’s Epcot front-entrance topiary garden, “Welcome Spring Fun, Food and Flowers,” is inspired by a vintage Walt Disney short film featuring Mickey Mouse, Minnie Mouse, Daisy and Pluto. 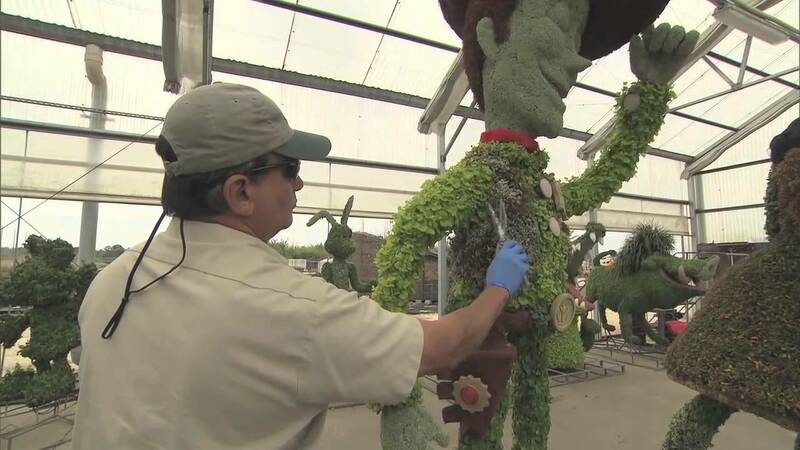 Behind Spaceship earth, a new 6-foot tall Figment topiary can be found atop a 5-foot ball made from yellow Joseph's Coat. New this year is a brand-new Belle topiary in the France Pavilion, featuring realistic facial features like the recently introduced Snow White and Frozen topiaries. Belle's yellow ball gown is created with golden blooming Joseph’s Coat and Creeping Jenny plants. Snow White and the Seven Dwarf's return to the Germany Pavilion. Anna and Elsa have a new home in front of Royal Sommerhus. World Showcase plaza is home to butterfly topiaries. Northern Bloom and The Berry Basket Outdoor Kitchens join 13 returning Outdoor Kitchens. Bites from Northern Bloom include Seared Scallops with French Green Beans and Butter Potatoes with brown-butter vinaigrette and Applewood smoked bacon. A Maple Popcorn Shake features Crown Royal Maple Whiskey. At The Berry Basket, the Lamb Chop with Quinoa Salad and Blackberry Gastrique can pair with the new Founders Raubeaus Pure Raspberry Ale. View all the 2017 Flower and Garden Festival outdoor Kitchen menus. Garden Rocks concert series will expand to four days each week, with three concerts each Friday through Monday presenting pop musicians that span multiple genres over five decades. New acts this year: Simple Plan, Exposé and Berlin featuring Terri Nunn. View the full Garden Rocks performers line-up. The festival this year runs through until May 29 2017 and is included with park admission. View the 2017 Flower and Garden Festival Passport guide. Click the gallery to get started on the photo tour.